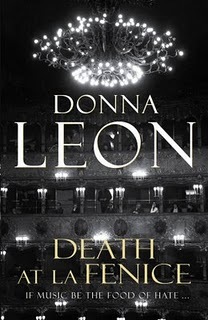 Having finished this Donna Leon mystery set in Venice, I’m a bit disappointed. This first Guido Brunetti story is marvelously written. The language, dialogue, characterizations are all superb. (See previous post here.) The mystery aspect of the story, however, is not up to par. A famous German conductor, Maestro Helmut Wellauer, is poisoned during a performance of Verdi’s La Traviata. He dies backstage between the Act II and Act III intermissions after drinking a cup of coffee laced with cyanide. Brunetti arrives and the investigation starts off well. We have the initial interrogation of the likely suspects, a look at the scene of the crime, and the set up for the police’s further inquiries. With so many people on the scene (over 100 involved in mounting the opera), Leon deftly zeroes in on a small, select group of characters. Some lie about their whereabouts that evening. This intriguing beginning soon wanders off target. The rest of the novel is mostly consumed by Brunetti’s ceaseless digging into Wellauer’s past. It’s disguised as a search for motive, but it’s truly more a study of Wellauer’s character and what led to his death. Much of this is done through Brunetti’s interviews with the suspects and other characters. Strangely, a few pertinent clues (ones that raise obvious questions) are left by the wayside until very near the end of the book. About halfway through, I began to suspect the likely outcome. The ending perfectly suits the characters and their motives, but it disappoints in anticlimatic fashion. Death in La Fenice is an excellent story, however. I thoroughly enjoyed it on that level. Though I think the mystery element ultimately fails, the portrait of Brunetti and these characters who populate Leon’s beautifully portrayed Venice is a pleasurable read. Recommended for mystery fans who enjoy a slower pace and intimate look at characters and their psyches.